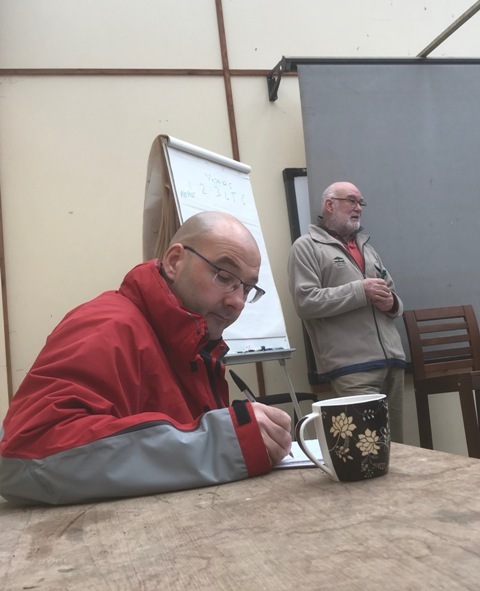 Yesterday, Saturday 17th November, we staged the last but one of our regular monthly workshops of 2018 and what a busy day we all had! I will start off by thanking both Caz and Scott for the support that they gave during the day, in fact, with the certain knowledge that I would have their assistance I had recklessly accepted eleven bookings for the workshop. In the event one participant was unable to attend but even at that it resulted in a pretty long, hectic, but enjoyable day for us all. The usual start to the workshop. 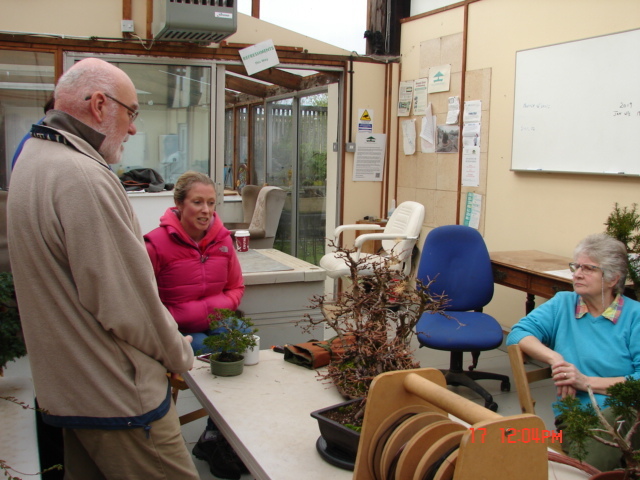 One of yesterday’s participants has since thanked me saying how much knowledge they have gained from taking part in these days and that the knowledge acquired is leading to a significant improvement to her trees. 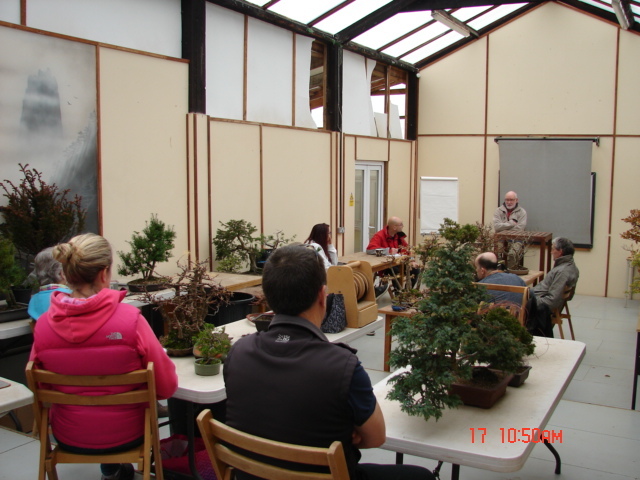 The workshop scenario should be as much about everybody gaining greater insights and understandings as it is about the practical work done on the trees themselves, anyway, that is our philosophy here at Willowbog Bonsai and judging by the regular attendance and the numbers it looks like our regions enthusiasts support that view. For the third month running we spent sometime talking about preparations for the forthcoming winter. At this point my main purpose is just to get folk thinking more carefully about their individual trees, what they need in the light of the way they responded to the earlier parts of the year, and what steps can be taken having worked out those particular needs. 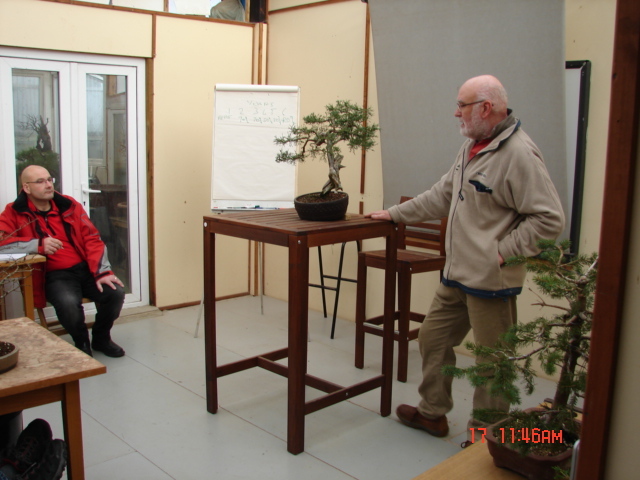 Antony is one of those regulars that likes to make notes of the points that he considers relevant to him and his bonsai, others just listen and try to take in as much as they can. It has taken me nigh on thirty years of listening to the likes of Marco Invernizzi, Mark Noelanders, Ryan Neil and Peter Warren to absorb just the small amount of understanding that I now have. 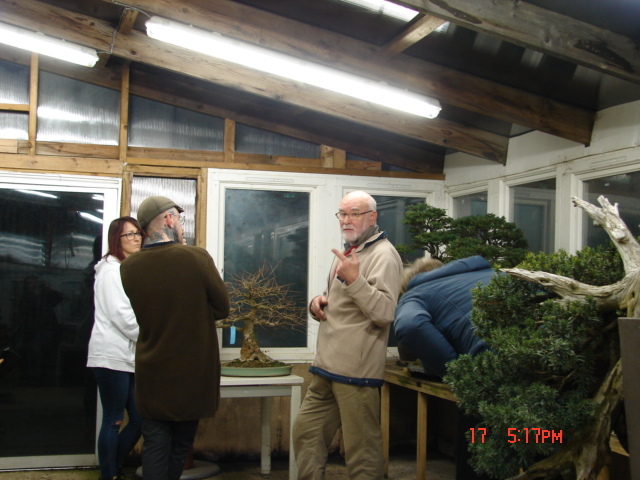 Of course, as I said to someone yesterday, I am still learning and do so in particular each time Peter Warren visits the nursery. 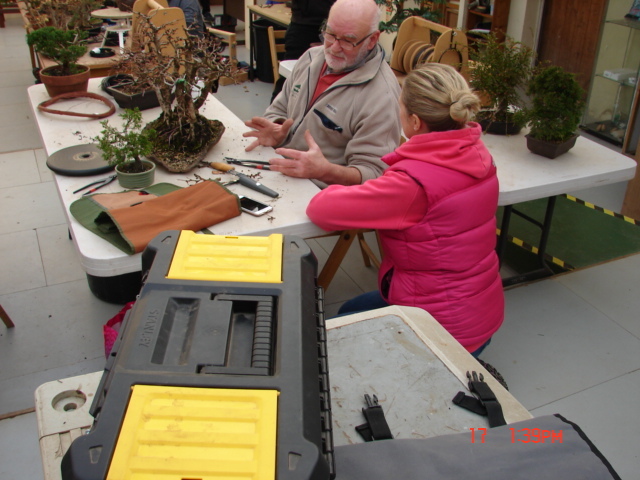 Then we made time to discuss some of the bonsai brought along on the day to the workshop. 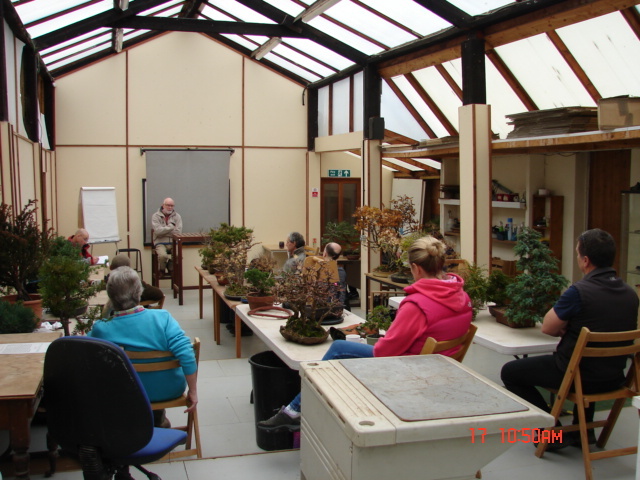 We had one person participating in their first ever workshop with us, the tree in front of me in the photo is Chris’ juniper. Looking at Kate’s table of trees, Kate, in the pink, makes the two hour plus each way trip from north of the border to join us for some of these workshops. Time then for a bit of practical application. Everybody hard at work and the short spell before the brief lunch break. This can be a good time to work on larch, the group planting under discussion here, so long as some thought is given to a bit of extra protection should the winter be a bit harsh, that is the case for even such a normally tough species as larch. 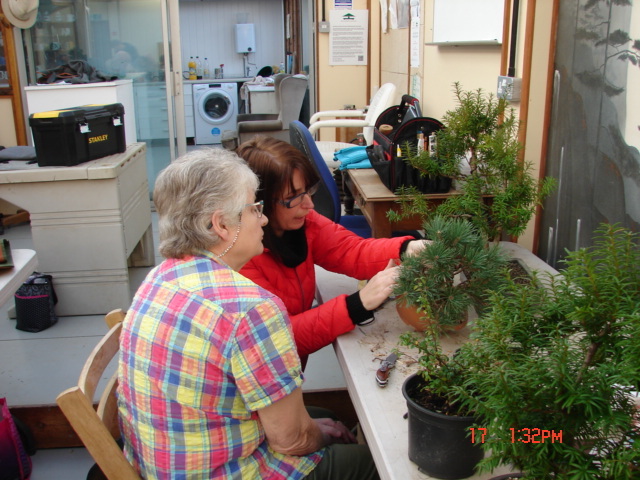 Caz helps Willowbogger Norma with some of her trees. Thanks due to Norma for the great box of windfall apples that our Highlanders will very gratefully scoff ! 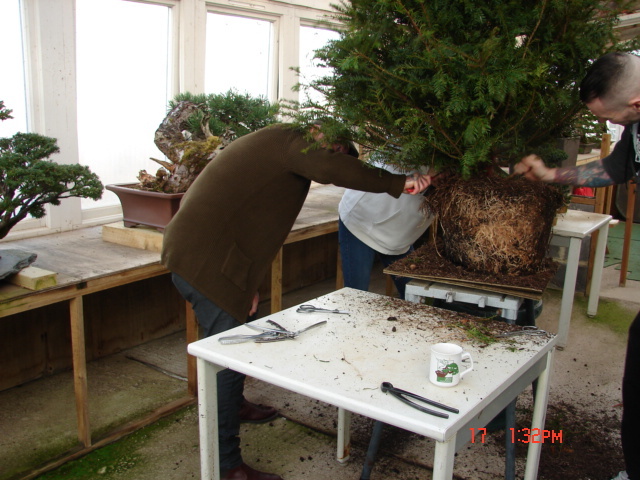 Meanwhile in the adjoining greenhouse Scott helps Dan and Rowena with Dan’s newly acquired Taxus baccata . Searching for that elusive nebari !! Lots of nice fibrous roots in evidence. Lights on in the greenhouse in the gathering gloom of the early evening as I chat to the pair of them about a purchase that Dan was about to make on the table between us. A nice mature Korean hornbeam to add to his burgeoning bonsai collection. So ended a long and, for an elderly gent such as myself, tiring day. 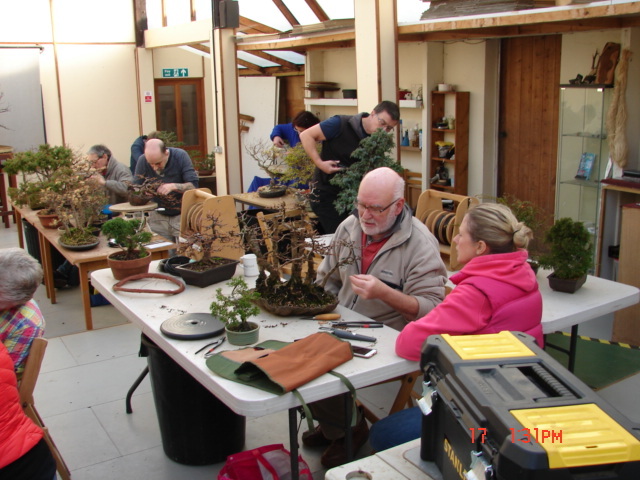 But satisfying for me to see so many enthusiasts getting so much our of what we do here at Willowbog Bonsai. Thanks to all participants but especially to Peter G who took these photos for me.